Earn up to 1,195 reward points. High-output single-coil size rails humbucker. The two thin blades, strong ceramic magnet and powerful coil windings of this Hot Rails Strat Pikcup Set give you the incredible sustain and a fat, full sound that's needed for playing heavier rock music. This pickup responds to the subtlest finger movements. Comes with four-conductor hookup cable. 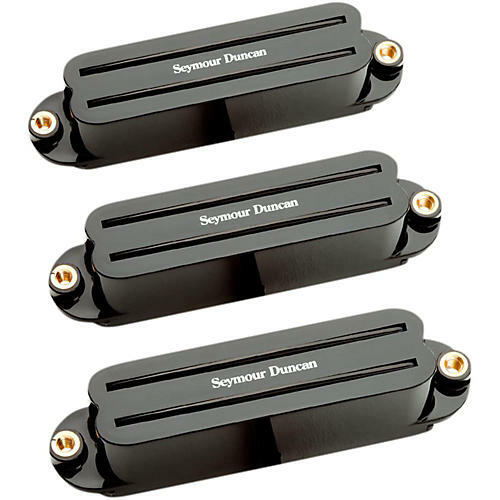 One of the hottest pickups that Seymour Duncan makes, the Hot Rails Set triples the aggression, transforming a mild-mannered Strat into a punishing metal beast. You may love your Strat, but wish it it would be more suitable for heavier styles. The Hot Rails Set is perfect for wanting a powerful humbucker sound out of a guitar. Like all Rails models, the Hot Rails are true humbuckers, so they remain quiet when you aren™t playing. Order this Hot Rails pickup set for your Strat today!